CALGARY, ALBERTA--(Marketwire - May 15, 2008) - Boxxer Gold Corp (TSX VENTURE:BXX) ("Boxxer" or the "Corporation") announces results from an ongoing surface exploration program on its 100% owned Boss project located in the Goodsprings Mining District, southern Nevada. The current program consists of surface work on the Boss Extension and collecting representative samples of the various styles of mineralization for preliminary metallurgical test work. 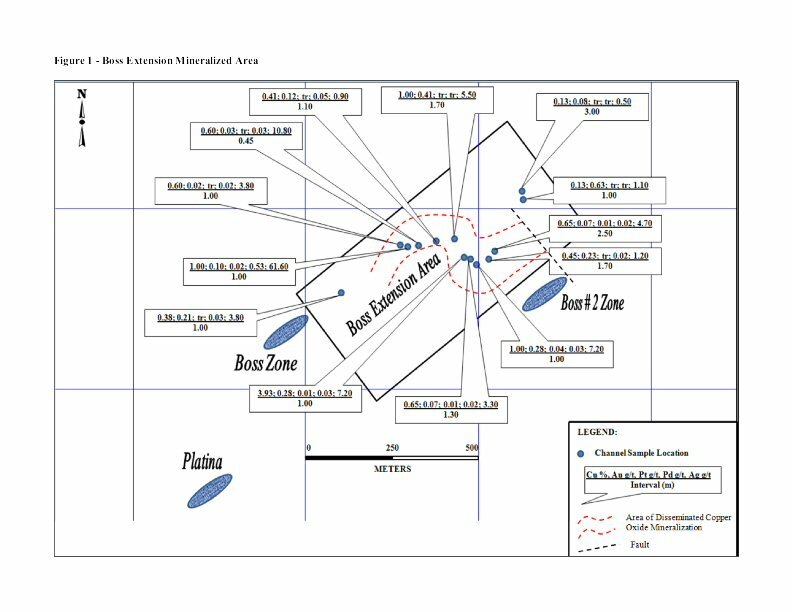 The Boss Extension area is located between the former Boss Mine and the Boss # 2 Mine (Figure -1). Historical production in this part of the district around the turn of the 20th century came from high-grade copper veins with significant concentrations of platinum, palladium and silver and gold mineralization. Mr. Elmer Stewart, President and CEO of Boxxer stated, "The results of the recently completed surface work suggests that a large continuous zone of disseminated and veinlet style copper oxide mineralization occurs within the Boss Extension. The mineralized zones located to date contain high cobalt and nickel and sporadic molybdenum concentrations. The alteration and mineralization occurs around a circular positive magnetic feature interpreted to be a high level porphyritic intrusive. These features support a magmatic source for the mineralization in a skarn related porphyry style of mineralization similar to that which occurs in Ely, Nevada and Christmas, Arizona". - Disseminated, streaks and veinlets of copper oxide mineralization occur in outcrop over an area that is approximately 600 m long by 250 m wide and minimum vertical distance of 100 m in altered limestone. This area occurs between the former Boss Mine and the Boss # 2 mine. Previous work within this zone located 10 showings of copper-gold-platinum-palladium-silver mineralization (see News Release dated April 22, 2008). The current work was completed to determine extent and nature of the mineralization in and around these showings. Detailed prospecting has located areas with disseminated, streaks and veinlets of copper oxide mineralization hosted in altered limestone, the approximate extent of which is shown in Figure -1. Within the larger area, outcrop measuring 40 m X 50 m contains higher concentrations of copper oxide mineralization with lesser amounts of copper oxide mineralization located between these areas. Due to the surface leaching effect of the arid environment, locating this style of mineralization in outcrop is difficult. To the southwest of this zone, the altered limestone is overlain by medium to coarse grained limestone. Samples of the lithologies and mineralization have been collected and submitted for petrographic study to determine the minerals present and styles and intensity of alteration. The actual thickness of the mineralization in the Boss # 3 has not been determined. Additional sampling in this zone is required to determine the extent and thickness of the mineralization in this zone. The altered limestone and all mineralized areas including Boss Mine, Boss # 2, the Boss Extension and the sample locations shown in Figure -1 occur around the northern edge of the interpreted intrusive. The mineralization in the Boss # 3 zone occurs in the same altered limestone similar to that which hosts the other 13 zones of copper-gold-platinum-palladium-silver mineralization on the southwest side of the property. A mafic dike (possibly basaltic in composition) occurs in the lower level cross cutting the altered rock. G & T Metallurgical Services Ltd. located in Kamloops, British Columbia have been retained to complete the preliminary metallurgical test work on representative samples of the various style of mineralization from the Boss property. Boxxer is currently contacting diamond drilling companies in the United States to undertake a drilling program on the Boss Mine, Boss Extension and Oro Amigo zones. The drilling is expected to commence on completion of the planned work. All channel samples were collected with a hammer and chisel and represent continuous sampling of the material within the sample interval. Sample weights ranged from 2 to 4 kilograms and sample intervals ranged from 1 to 3.4 metres. All samples were prepared ALS Chemex laboratory in Winnemucca, Nevada and were analyzed by ALS Chemex in Vancouver, British Columbia using PGM- ICP 23 for gold, platinum and palladium and ME-ICP41 for silver and copper and other metals. ALS Chemex's quality system complies with the requirements for the International Standards ISO9001:2000 and ISO 17025:1999. Analytical accuracy and precision are monitored by the use of international and in-house standards. For more information on Boxxer please visit our website at www.boxxergold.com. Forward Looking Statements: This news release contains forward - looking information including but not limited to comments regarding the timing and content of upcoming work programs, geological interpretations and potential mineral recovery processes. Forward - looking information includes disclosure regarding possible future events and therefore, involves inherent risks and uncertainties. For any forward looking information given, management has assumed that the analytical results it has received are reliable, and has applied geological interpretation methodologies which are consistent with industry standards. Although management has a reasonable basis for the conclusions drawn, actual results may differ materially from those currently anticipated in such statements. For such statements, we claim the safe harbour for future.